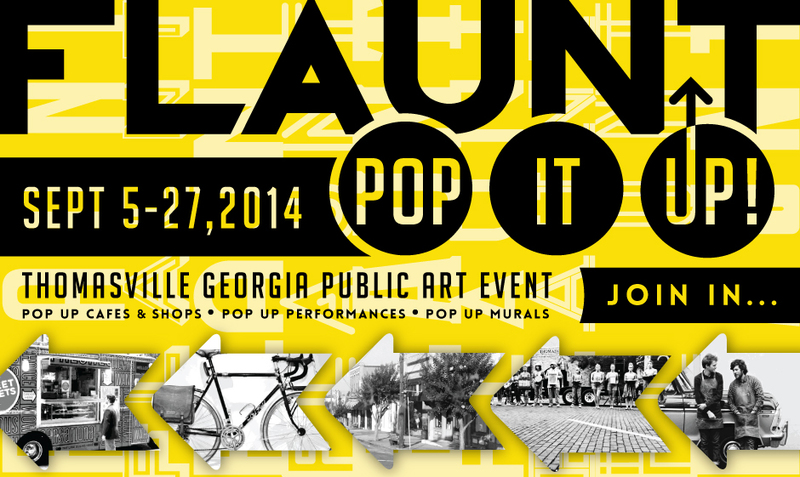 Department of Art | Thomasville, GA Public Art Event: Don't Let This Opportunity Pass! 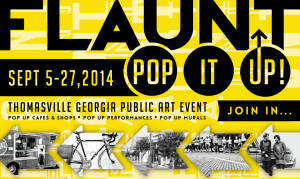 Home » Thomasville, GA Public Art Event: Don't Let This Opportunity Pass! Thomasville, GA Public Art Event: Don't Let This Opportunity Pass! Flaunt 2014: Pop It Up! Thomasville Center for the Arts and City of Thomasville, Office of Main Street & Tourism, in partnership with Hurst Boiler Company, presents FLAUNT 2014: Pop It Up!, a month-long installation of music, food, historically inspired murals, and shopping on the Jackson Street corridor in Thomasville, Georgia. This is an amazing opportunity to present your work during the month of September through a Pop Up experience in Thomasville, Ga.
JOIN US in shaping the new Arts District in downtown Thomasville. Pop Up your own work and find your place. The deadline for Shops, Cafes, Artists & Performers is 6/30. Launch a new business, showcase a new product, or “follow your dream”! Be one of the creative entrepreneurs who will make a mark on the Jackson Street corridor, and help shape the new Arts District. Spend one month with the perks of a brand new business on the historic bricks. Create one of thirty historically inspired* murals in the Arts District for a month-long exhibition of public art on the bricks. Take advantage of the opportunity to sell your work on the Jackson Street corridor during the month of September. Celebrate the historic “Bottom” and its connections to our southern heritage. Pop Up your performance while creating a public experience for the pedestrian shopper. Grab the chance to “make-it-big”. Take advantage of this blink-or-you’ll-miss-it “pop-up” experience while claiming your place in our downtown. Bring your “inner chef” to a pop up dining spot on Jackson Street! Use the short-term nature of pop up dining to create something new for the palate. Restaurants and food truck owners are encouraged to apply. Invest in the creative vision of our new downtown Arts District! Bring awareness of your brand to our location rapidly and in dramatic style. By sponsoring FLAUNT 2014, you will be instrumental in helping to revitalize the Jackson Street corridor using music, food and art, while providing funding for arts education. Get involved with the artists and makers of Thomasville. Get busy at Studio 209, creating flags, sponsor signage, t-shirts, artist bags and lots of other creative projects. To learn more call Darlene Crosby Blackman at 229.221.1859.